I hope everyone had a lovely holiday weekend! I am gearing up for the new year and I am so excited to bring you even more of my original Fashion meets Interiors series in 2017. Today I’ve invited Canadian fashion blogger Britney Wilson to share her interpretation of this luxurious and retro interior space. I must stay that I love the look she came up with. I’ll let Britney take it away from here. You’ll love her chic style! Hi, Lovelies! My name is Britney Wilson, and I am the creator of the fashion and lifestyle blog, Pretty Little Hangers. Toronto is the city I call home, but I’m notorious for traveling to exotic destinations around the world to capture unique content to share with my readers. Pretty Little Hangers started as a creative outlet where I could express my love of fashion through inspirational looks that I personally styled; however, within a little over a year; PLH transitioned into an online destination for not only styling tips but trend guides, beauty hacks, and enriching lifestyle tutorials as well. 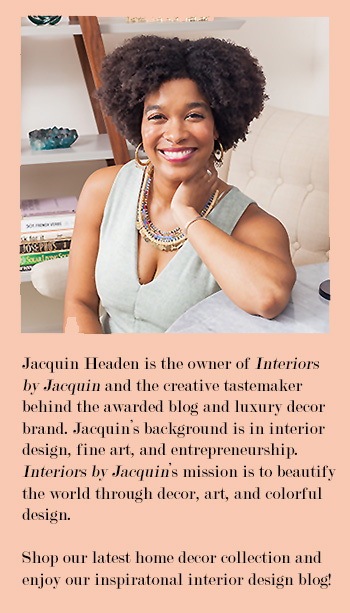 When Jacquin invited me to participate in the Fashion Meets Interiors segment on her blog, I was delighted to share my thoughts on the interior space of my choice. 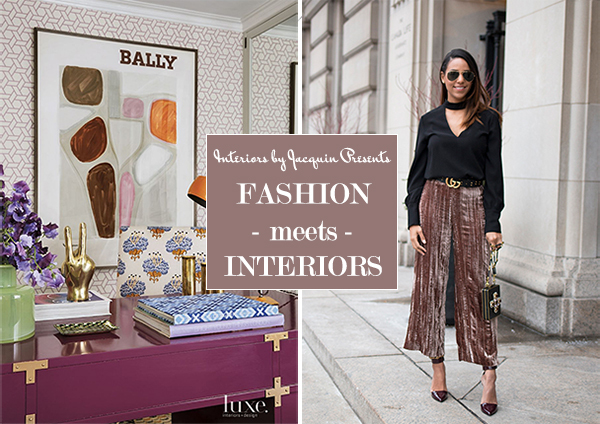 If you asked me whether or not I think fashion influences interior design trends, my response would be absolutely! After reviewing this interior space, I was captivated by the beautiful patterns, colors and gold accents. Since this space has a retro 70s flair, I knew these velvet culottes would be the perfect piece to convey this style. I combined hints of plum along with a stylish keyhole blouse and blazer draped over my shoulders to complete my chic office-friendly look and accessorized with stunning gold accented pieces. Santa Monica residence with modern, vintage feel. Interior design by Burnham Design, Photography by Laura Hull. I was captivated by the beautiful patterns, rich colors, and gold accents. Since this space has a retro 70s flair, I knew these velvet culottes would be the perfect piece to convey this style. This interior design is the perfect example of how fashion and interior design trends correlate with one another. Incorporating gold as an elegant accent piece is common in both interior design and fashion. The gold accent pieces and hardware in this office space help to create a polished yet stylish look. 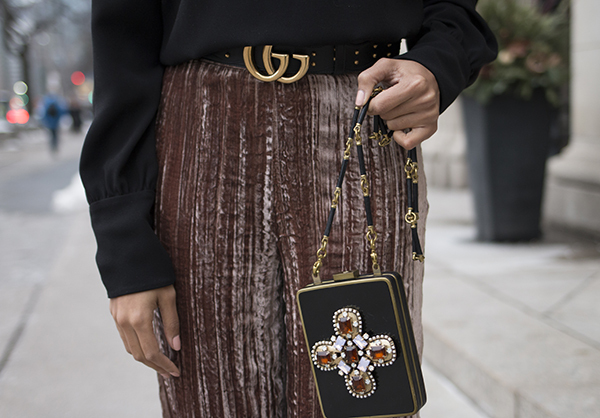 Using gold for ornamentation and stylish accents is a timeless element of fashion. If you get a chance to read the latest issue of Architectural Digest or Vogue, you may notice this distinct trend. Textiles, color palettes, patterns, accessories and hardware merge in an innovative yet effortless way, blending the design element of fashion and interior design. Stay tuned for more great posts on Interiors by Jacquin and be sure to stop by Pretty Little Hangers and say hello to Britney. You can also follow along with Britney’s fashion curating on Instagram. Thanks for reading!